The final two players in the $500 Seniors No-Limit Hold 'em event, Ted Spencer and Tony Vlahos, has decided to end play and officially be Co-Champions of the event. They both take home $18,601 for their victory!!! On a flop of [Ks][Js][5h], Ted Spencer bets 75,000 and Tony Vlahos raises to 150,000. Both Brian LeBlanc and Spencer make the call. The river comes the [5s], completing Vlahos's flush and eliminating LeBlanc in 3rd place for $18,600. The final three players have decided to evenly chop the remaining prize pool and play for the World Poker Finals Trophy and watch. First place will take the trophy while second place will take home the watch. We had a total of 90 players in the $400 Pot-Limit Omaha High event at the Foxwoods World Poker Finals. The board comes [Kh][Qc][4d][9s][Qd] and LeBlanc makes a straight to win the pot and eliminate Wityak in 4th place for $8,630. The board runs out [7d][5d][2d][8d][3h] and Spencer wins the pot to eliminate Matthews in 5th place for $6,620. Steve Daniel moves all-in from under the gun for his last 75,000 and is called by both Tony Vlahos in the small blind and Brian LeBlanc in the big blind. The river is the [2d] and LeBlanc wins the pot with a pair of kings to eliminate Daniel in 6th place for $5,380. The board runs out [9c][7c][3h][2d][2s] and Spencer's hand holds up to eliminate Chakoian in 7th place for $4,492. The board runs out [Th][5c][3c][Jh][8d] and Spencer's pocket fours hold up to eliminate Riordan in 8th place for $3,665. Neal Friets raises to doubles the big blind to 48,000 before the flop and Ted Spencer calls from the big blind. The flop comes down [Jc][Td][8s] and Spencer checks. The turn is the [Ks] and the river comes the [7c]. Spencer wins the pot with a pair of jacks and eliminates Friets in 9th place for $3,080. The turn is the [Ac] and the river comes the [9h], giving Bartleson trips but Spencer a full house. Left with just 6,000 in chips, Bartleson was eliminated on the next hand by Neal Friets. Nancy Bartleson is eliminated from the $500 Seniors event in 10th place for $2,246. We have reached the final table of the $500 No-Limit Hold 'em Seniors event. The players are currently on dinner break and play will resume at 7:20pm ET. The $400 Pot-Limit Omaha High event is now underway. - There are currently 19 players remaining with blinds at 5,000-10,000 with a 1,500 ante. The average chip stack is now 291,500. - You can watch this event live by clicking "Watch LIVE Video" at the top of the page. - There are approximately 218 players remaining out of the 470 players who started. The blinds are 500-1,000 with a 100 ante. The average chip stack is 32,300. The final 50 players will finish in the money. - This event kicks off in just about one-hour and features 10,000 in starting chips with 40 minute levels. We had a total of 470 players in the $300 NLHE Deep Stack event at the Foxwoods World Poker Finals. 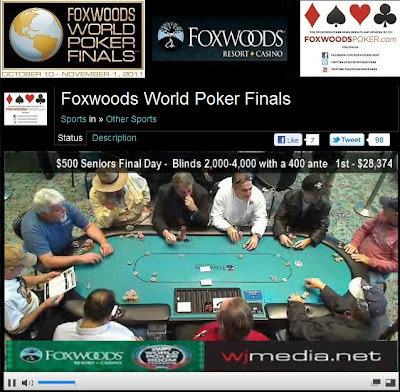 $500 Seniors Day 2 Now Streaming Live! 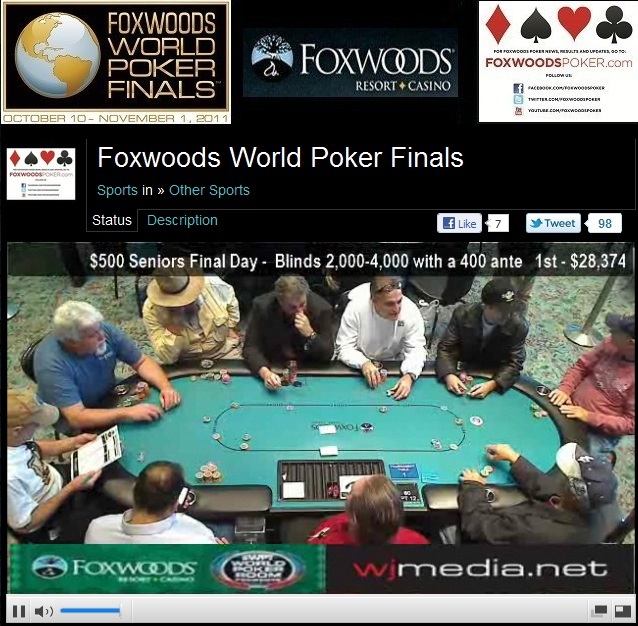 The final day of the $500 Seniors Deep Stack event is now streaming live. Just click "Watch LIVE Video" at the top of the page to view the live feed. There are 51 players remaining and the blinds are now 2,000-4,000 with a 400 ante. The average chip stack is 106,500. The final seven players in the $600 Deep Stack No-Limit Hold 'em event came to an agreement on an equity chop. Ryan Methia and Tuan Le are officially co-champions of the event. Both players take home $41,000 with Methia taking the World Poker Finals Trophy and Le taking the watch. $300 Deep Stack Event Underway! The $300 No-Limit Hold 'em Deep Stack event at the Foxwoods World Poker Finals is now underway. Paul Bernier has been eliminated in 8th place for $7,054. Karl Held has been eliminated when his pocket fives failed to hold up up against Wendell Weaver's [Ad][Qd] when Weaver made a flush. Held takes home $5,785 for his 9th place finish.